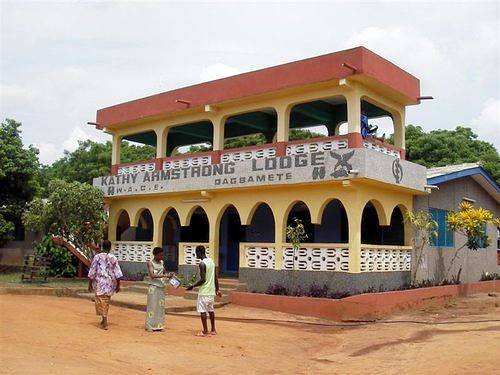 The Kathy Armstrong Lodge has single and double rooms, a sitting room, dining hall and a porch. The lodge has running water and electricity, and there are showers and flush toilets. The Lodge can accommodate groups of up to 36 persons. Double rooms are GHC 25 per person per day. Bath is shared. 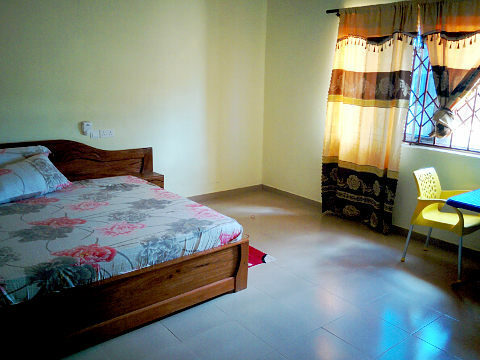 A few double rooms with private bath are available for GHC 30 per person per day. Meals are not included, but can be arranged at extra cost. Double rooms with shared bathroom and three meals per day are USD 55 per person per day. Double rooms with private bathroom and three meals per day are USD 75 per person per day. Maggie Yevuga Dunyo, Manager. Phone: 024-450-8650. A new guest house in the Avegodo (sacred forest) area of the village is available for short term visitors who have a connection to the village either through family or through the shrine. It has 8 spacious rooms with double beds and private baths. Those wishing to stay at the new guest house should contact Sammy Davor at sammydavor22@yahoo.com or call 020-902-7824. Members of the Apetorku Shrine are entitled to free accommodation, including free food, during the Easter and Midyear festivals. Members are put up in facilities throughout the village. Bedding is not included; members must bring their own. Shared outdoor bath and shower facilities are provided.